Shalom and welcome to עִבְרִית בִּתְנוּעָה, or “Hebrew through Movement,” a language acquisition strategy in which students learn Hebrew by hearing and responding to Hebrew commands. Hebrew through Movement is an adaptation of James J. Asher’s Total Physical Response (TPR). Hebrew Through Movement is being used in Jewish congregations, day schools, camps, early childhood programs and other settings. HTM does not teach communicative Hebrew, but students can easily move on to other Hebrew forms (as early childhood and day school colleagues will attest). And camps just have a lot of fun! Hebrew Through Movement introduces Hebrew in a playful and meaningful way, creating a positive first link between children and Hebrew. Hebrew Through Movement (HTM) is supported by the latest brain research on learning, providing an aural foundation for Hebrew that opens the door to more facile Hebrew decoding and reading. This curriculum is a guide and not a recipe or blueprint because Hebrew Through Movement works best when it is responsive to specific individuals, groups and settings. Educators working at schools, camps or other part-time educational settings are encouraged to select or adapt units that are right for them -- this is what makes HTM most effective. We hope you will enjoy using this program and will be pleased with how happily and productively your children learn. 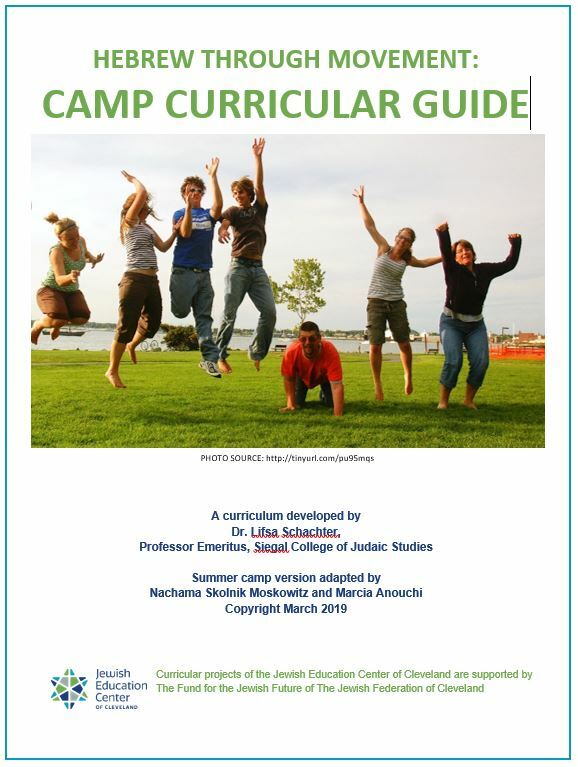 ​Scroll down this webpage for links to the General (revised summer, 2018) and the Camp guides (draft, 2019) Both are a free download. Just click! ​INTERESTED IN BECOMING A MASTER TEACHER? Apply to the Cleveland summer seminar, July 14-16, 2019. Click here for information. The documents have been formatted for printing back-to-back. ​Both are a free download. They may be printed fully in color (expensive, but the photos will be crisp!). Or they may be printed in black and white, with only the cover in color. The choice is yours! This document is for congregational/part-time, early childhood and day schools. It was revised in Summer, 2018 to be more gender sensitive and take care of typos. Also includes updated photos. Note that this version has 160 pages - teachers will want to ask their directors to download and print for them. This document is for camps. There are 82 pages. ​As a draft, we welcome your feedback! WANT TO BE A SKILLED HTM TEACHER? HTM is a key part of #OnwardHebrew's Sound-to-Print approach to Hebrew learning. For more information: http://OnwardHebrew.org. jPrayer﻿ is a curriculum that integrates teaching prayer for meaning, Hebrew Through Movement and decoding skills. http://JECC-jPrayer.weebly.com. "We started using Hebrew Through Movement in our Hebrew School this year and it has TRANSFORMED our school. The children LOVE it and they continue using the words and actions from HTM in their regular classrooms. Parents have told me that the kids are even using the HTM Hebrew at home!!! Last night, a mom asked her son to sit down at the dinner table and he replied, "Lo lashevet!!!" ("don't sit down!"). When the students see the Hebrew Through Movement teacher in the hallways, they immediately ask her, "Are we going to have Hebrew Through Movement today?" The students love getting up and moving around while they are learning. I am going to expand the program into Kindergarten through 2nd grade next year so that the children will have a solid base of Hebrew words before they begin their formal Hebrew School classes in 3rd grade. Hebrew Through Movement has made a huge difference in the quality of our Hebrew program. I recommend that every school begin this program!!" with the support of Nili Adler z"l, Marcia Anouchi and Gloria Grischkan, and the Hebrew teaching staff of The Temple - Tifereth Israel & Temple Emanu El, Cleveland, OH. It is based on Dr. James J Asher's Total Physical Response (TPR), as well as the work of Bina Guerrieri who was one of the pioneers in applying TPR to the teaching of Hebrew.